Roof Cleaning in Sacramento – Call For Your Estimate Today! Monster's Gutter has been cleaning all types of roofs in Sacramento for many years. our well-trained staff uses proven techniques when cleaning your roof. Our methods and customer service give us the ability to safely provide a high-quality service and are the roof cleaners of choice in Sacramento. Our experience speaks for itself. We have pressure washed just about every type of surface you can think of and have hundreds of satisfied clients. Due to the great weather here in Sacramento, for must of us, it is only necessary to perform a roof cleaning Sacramento only once every 10years. Since this is the case it only makes to have a professional come out and perform this dangerous task.On this page we will explain our professional roof cleaning process, and after you like what you see then don't hesitate to call. We know that we are your best option for a professional roof cleaning Sacramento. Our total roof cleaning includes blowing off all the debris & chemical washing the roof to remove moss & algae in Sacramento, California. Roof cleaning Sacramento has been often requested by our clients. After years of cleaning their gutters, clients have asked "while your up there can you clean the roof as well," while some specifically call us to clean just the roof. It was decided we would offer the service to our clients to keep their roof's clean & removed of all debris. Who wouldn't want a full-service contractor to inspect their roof while cleaning it? Roof cleaning Sacramento is the process to remove dirt, algae, and moss from roofs. Roof cleaning can extend the duration of a roof's ability to function. 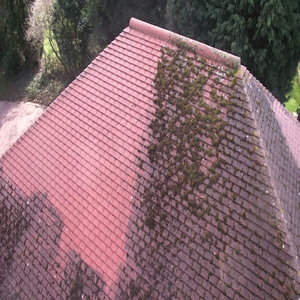 Algae and other types of build-up often form on parts of roofs that are shaded and can reduce a roof's life expectancy. The presence of soot, dirt, or biomass can affect how much sunlight is absorbed by a roof and thus the amount of heat a building absorbs. Let's face the fact that we need to keep our roof's clean. When leaves pile up on the roof we need to get out there & get to cleaning. Eventually, leaves will begin to decompose on your roof thereby causing damage to your roofing. Our Sacramento clients have come to understand the importance of cleaning their roof's every year before a storm rolls into town. Not to mention this is the city of trees here in Sacramento California. When the roof deteriorates water can begin to enter your home & severely damage the frame, roof & foundations. Why Get a Roof Cleaning? When the fall hits & you clean your gutters don't forget cleaning the roof Sacramento. Here at Monsters Gutter Roof Cleaning Sacramento, we work hard to ensure we protect the residents of Sacramento from serious water damage in their home by proactively taking action to prevent damage. Many homeowners in Sacramento forget about the roof. They clean their gutters and leave the leaves all over the roof which end up decomposing or in the gutters. Roofing is not a forever material all types of roofing have a lifespan. Roof cleaning is essential to make the most of your roof's life. And not the cleaning that some companies provide with a pressure washer. Blowers & light user of water is recommended. We express to all of our employees that no job is worth injury. We prevent injury by always using a fall suppression system, sometimes referred to as a roof safety system. We also require our staff to wear safety glasses, nonslip boots when necessary as well as other safety gear. Sacramento roofs get filthy. The main problem with this dirty mildew, mold, and mud don't just go away. They have to be removed, and if they are not then it continues to build up. If a roof cleaner does not take the proper precautions roof cleaning can become very messy and blow on to your neighbor's property. If you do not have a roof cleaning Sacramento that is mindful of this then you can end up with some unhappy neighbors. It is our standard to make sure that not only your property but your neighbor's properties are as clean as they were before we arrived. Depending on how dirty the roof is we sometimes may need to calculate in the time that it will take to clean their property as well. Depending on how close the pool is to the roof and how dirty it is. We may need to cover the pool to prevent debris from getting into it. The roof pitch can be determined in a ration of hight to the horizontal length. Some Victorian style roofs have a much higher pitch which makes for a more dangerous work environment. For roofs with extreme pitches, a lift will need to be calculated into the cost. For standard roofs, this is not the case. Roof Cleaning Sacramento is dirty work. What we enjoy most about being roof cleaners are the results that can be seen simply be looking at the roof after we have completed our work. There is never a doubt that by the time we have completed you will see a huge difference. However what good is a clean roof if all of the filth that was cleaned off is now on the ground around your's and your neighbor's houses. We always perform a complete cleanup. This means that we will wash and blow off all the debris that came down from your roof. Pressure washing is the most effective way to clean hard services such as metal or concrete tiles. We make sure to use a PSI that will not damage the roof. A reason that we use pressure washing is to make sure that we remove all the embedded dirt. 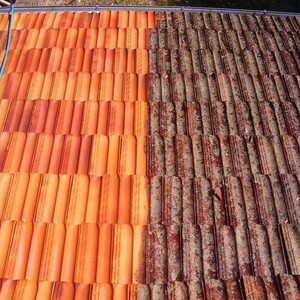 Concrete tiles are typically more porous than clay tiles making it a little more difficult to remove all the debris when performing a roof cleaning Sacramento. We are huge on safety. It cannot be stressed enough to our staff, that safety comes first. Many contractors who perform this type of work do not use the proper safety gear. This can lead to a disaster which is why we always use the proper gear. There are many types of different styles of roofs. Roof cleaning Sacramento requires an understanding of these different types of roofs so that cleaning is effective and efficient. Cross gabled and cross hipped roofs a pretty common. Cross hipped roofs will create problems where the dirt and grime from one side will get over to the other. For these types of roofs we typically clean from the top down. Most roofs have some leaves scattered around, pine needles and other bits of debris. When these leaves and pine needles begin to accumulate, they will become a threat to the integrity of your roof. Piles of leaves tend to absorb moisture which becomes heavy and moldy which will cause problems with your shingles which will reduce the over the life of your roof. Most of us love lushes tall trees. However, it is recommended that you keep your trees and its branches from growing over your roof. By doing so you will be preventing years of leaves and twigs from gathering up on your roof & gutters to cause bigger problems later on down the line. By getting rid of these limbs you will be preserving the life of your roof for several additional years. If you need a roof cleaning Sacramento it is recommended that you seek out a licensed contractor. Anyone out there can say that they are a professional at their trade but if they haven't taken the proper steps to become a legal contract then how can you ever trust them to pay attention to the details while working on your home. You can go on to the CSLB website to see if their license is valid and if they are bonded and insured. If you think you are ready for a roof cleaning Sacramento then do your research on Monster's Gutter and give us a call. We assure you that you will not be disappointed. Although Sacramento residents may not need roof cleaning often, knowing when it’s time to schedule a roof cleaning appointment is a key to maintaining a beautiful roof and home exterior. If you have any questions about whether your roof could benefit from cleaning, Monsters Gutter Sacramento can perform a quick inspection and make a recommendation. 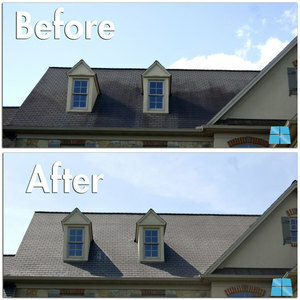 Visible stains on your roof are a sure sign that cleaning is needed. Stains often appear as dark streaks on certain areas of your roof; they may even extend past your gutters and onto your siding. Although the largest debris will be blown off your roof within a few days, areas that appear to have been bogged down in leaves, dirt, or other debris for several weeks are in definite need of a professional roof cleaning. Moss, mildew, or algae growing on any part of your roof, particularly between shingles, is a clear signal that professional roof cleaning is needed.